Home > Blog > Is mF and mFd the same as uF? Will the real Microfarad please stand up? Is mF and mFd the same as uF? Will the real Microfarad please stand up? For those just starting out learning about electronic components (specifically capacitors and capacitance), we know that there can be some confusion related to this topic. In short, the answer is yes — mFd is the same as uF- which is also the same as the symbol ‘µ’ as seen in ‘µF’. Technically ‘mfd’ represents ‘milliFarad’ while ‘uF’ stands for ‘microFarad’ which is an order of magnitude smaller. Here is where the confusion begins. Some older capacitor manufacturers used ‘mF’ in place of uF on their capacitors. Whether it was because their machines could not imprint the correct symbol ‘µ’ or for another reason not known to us, this was the common practice. 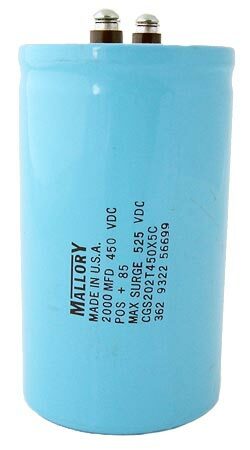 Nowadays, we see about 25% of the capacitors that come into our warehouse marked as mFd but we RARELY have any that are truly milliFarads. On our site, we refer to microfarad as ‘uF’ to keep consistent and to make it easier for customers to find the capacitors they need. In the end. there is really no right or wrong – some other sites might use mF or mFd. If you need more information about capacitance, check out our handy capacitance conversion chart which will help you convert microfarads into picofarads and nanofarads. This entry was posted in Capacitors, Electronics History, Guides and tagged Capacitors, electronic components, Guides, tutorials November 14, 2012 by Jack.